The road links Peckham and Dulwich. It is named after Charles Barry the architect. It is said to be exactly one mile long. Named in 1867 but not finished until later in C19. 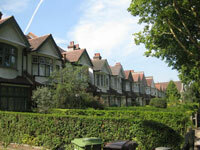 Mostly large Victorian villas, Busy with traffic and on the 12 and 197 bus routes. The road links Peckham Rye with Upland Road. Named in 1877 after the site of land known as Dunstan’s Herne. Good views of London. Busy road running from Peckham Rye Park up to Honor Oak and Forest Hill. Late Victorian terraced houses. Famous resident: Boris Karloff was born at No 36 in 1887. It runs from Peckham Rye up to Dulwich Park. The land was sold in 1864. The road was named in 1868 after Friern Manor (the house was on the junction of Friern Road and Underhill Road). 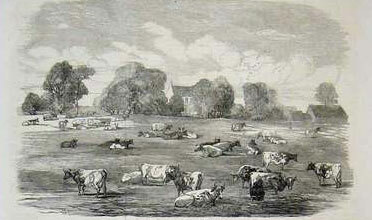 In 1864 the land was sold and the road was named in 1868 and developed with Victorian houses. A Flying bomb caused extensive damage at the Lordship Lane end in the Second World War. The site now has social housing on it. Some rush hour traffic but generally quiet. The old boundary of Dulwich and Friern Manor, it extends from Goose Green to Sydenham Hill. Mostly late Victorian from 1880s with many good shops etc. Famous resident: Enid Blyton was born at No 354. It runs parallel with Upland Road on a hill and was named in 1867. Mostly Victorian large family houses with good views of London. The road links Peckham Rye with Upland Road. Named in 1903. Another reference to the Crimean War. Scutari was where Florence Nightingale famously improved the health of British Soldiers from 1855. Runs from Peckham Rye south to Forest Hill border. Mostly mid-Victorian houses becoming larger as one ascends towards Forest Hill from Lordship Lane. Named in 1866 after John Underhill, a Bishop of Oxford in C16. Famous resident: CS Forester (author of Hornblower) moved with his family to 58 Underhill Road around 1911 whilst attending Alleyn’s school. Quiet road running op the hill from Barry Road to Dulwich Park with good views of London. Built on old Friern farm land and named in 1867. Large Victorian houses in one of SE22’s best locations. Some rush-hour traffic but generally peaceful. Several nursery and primary schools.